I’m not catholic, and I’m pretty certain that the only Italian in my blood is in the form of chianti. I’m also not above cultural appropriation, which is how I ended up cooking the Feast of the Seven Fishes December 24. Of course, food is one of the best ways to bridge cultures and differences, so I’m unapologetic. Also, my mother in-law is catholic, albeit Irish, and she was totally stoked about this dinner. If you’re unfamiliar with this tradition, its roots are in southern Italy, but it is definitely an Italian-American construct. Although the prohibition against eating meat on Christmas Eve was apparently rescinded in 1983, the tradition of eating fish has endured. And why not? Nothing can bring a family together like an afternoon in the kitchen! Are you noticing a theme? 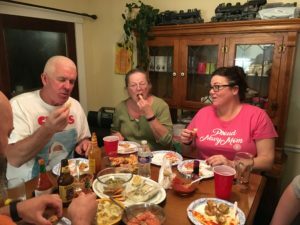 In-laws and outlaws enjoying an imperfect dinner. Just a week prior, I broke all my rules and cooked a breakfast for a friend. We all got to talking about the stress of the holidays, and one of the big ones was food. Why? Because everyone wanted to set the perfect table and have the perfect meal. Doing that means one of two things: you’re a professional, and you have a couple more professionals helping you, or you try to do it all yourself, micromanage everything, and make the experience miserable. Alternatively, you live in what my MIL calls the “land of -ish.” We’re going to have dinner at 7-ish. Dishes will come out every 20 minutes-ish. We’ll have 7 courses…-ish. Which is why we ended up with nine instead of seven fishes: anchovies, bacalao (salted cod), calamari, clams, crab, lobster, mahi-mahi, mussels and shrimp, That made for 7-ish courses (more if you count the bacalao and anchovies as separate appetizer courses, less if you consider that we ended up putting off the crab salad until the next day because we were so full!) We were going to have salt-crusted snapper, but could only get fillets. So sad. One of the big challenges I had, and something to consider when you cook any large meal, was limited cooking space and limited cookware. 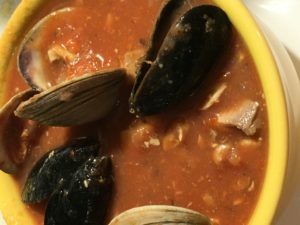 Some things (like soaking the bacalao starting the prior day, cooking the cioppino broth and reducing cream) could be done ahead: shout-out to my mother in-law here. Others had to wait for available space, either in the oven or on the stove, and some had to wait for my “dish pit” to get off its kiester and get me clean dishes. It helps to actually write down times when things need to be prepped/go on the stove/come out for service. You don’t have to stick to the times exactly, but having an idea of how the meal will progress helps keep you out of the weeds. 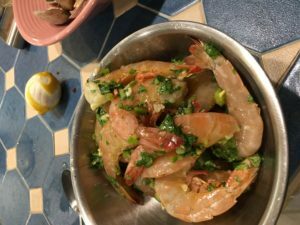 Size matters if you’re grilling shrimp. I’m not gonna lie: I took the laboring oar, but I had a LOT of help, which is what made it fun. The kitchen was just one big whirlwind of cutting, washing, assembly and EATING. Nothing turned out just perfect, and we served a lot of things in pyrex baking dishes, but it was delicious and everyone really enjoyed the evening. I’m serious about that cream. It will take hours on low heat. You can’t rush it. Steam the clams 8-10 minutes. If some don’t open it’s OK. Don’t keep cooking until you end up with super balls… If you have a pot with a pasta insert, that works great for steaming clams because you can continue to re-use your steaming liquid easily (you’re going to want to do 2-3 batches of clams). Use water, 1/2 cup wine and garlic. Reserve to add some back into the final mixture. Take the clams out of the shells (reserve the shells). Put and all other ingredients EXCEPT clams, bread crumbs and cheese in a food processor. Mix, then add clams and bread crumbs and pulse a few times. Put a spoonful in a skillet on high heat to cook. Taste and check seasoning. Adjust as necessary. Now put about 2 Tbsp. into each clam shell you have reserved. Sprinkle parmesan on top. Bake at 425 for 12 minutes. Serve individually for appetizers, or make pappa al pomodoro and serve 8-10 in a bowl as a main dish!